I've spent like $200 on tri gear in three days. I'm annoyed about all these little injustices, but glad they happened this week rather than next week. So Friday I went downtown to make the most of my Summer Hours at work. I planned to swim at Ohio Street Beach, run along the Lakefront Path and maybe hit up the Taste of Chicago afterwards. I knew from my last open water swim that my HUUB wetsuit was looking a little worse for the wear. This suit has little circle patches where the seams meet, and the one under my left armpit was amiss. I bought neoprene sealer and was waiting for it to come in, but I realized when I wiggled into the suit Friday the whole damn sleeve was coming unraveled. After talking with a five-time Ironman finisher Saturday who is a far more experienced swimmer than me, I realized I'd need special thread, sealer and a neoprene patch to repair the thing, which was only $100 to start with. Plus, then I'd have a seam and a patch in my armpit, which sounds like a recipe for all sorts of chafing. And I'd been talking about wanting a sleeveless wetsuit anyhow. So, with that, I ordered a new wetsuit Sunday morning. It was a great deal and is a much more sophisticated suit than what I used before. 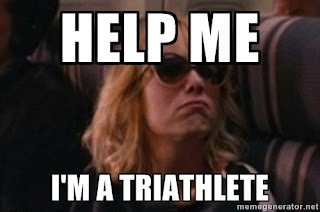 Plus, I've gotten enough use out of the HUUB to not feel bad about it. We had a few sprints, and Olympic, two half Ironmans and a full Ironman together. RIP, ripped friend. But my bike was a whole other level of disappointment. Suzie Slice is only 1.5 years old, but her tires have seen many miles. I knew they were looking a little sad. Last week, I woke up to a flat rear tire on my trainer. It's my third this season. Sunday was a total disaster - we went out for a 40-mile bike ride with a two-mile transition run. I got my first flat at mile 35. Then my second at mile 39. And only brought one tube. So my transition run had the longest T2 ever. Still counts, right? Another thing that annoys me: every flat tire is like a $12 commitment between the tube and the cartridge. I've procured a pair of tires for this weekend and new red tires are on their way. I also bought a 10-pack of tubes on Amazon for $35, so at least I've got that going. This is going to be an intense weekend - I've got the Hemingway 8K Saturday morning, then we're driving up to Egg Harbor for the Door County 70.3 and camping. Yeah ... camping. This is going to be an adventure of epic proportions. I'm going to need a massage for real. I thought about it some more and wonder if your tire problems are from riding on the trainer so much. Trainers tend to wear down your tire more quickly so they are probably just very worn out. Do you make sure to take the pressure off the tire from the trainer after every ride? That could be another problem. You should consider buying a trainer tire!